Abyssinians are one of the oldest breeds of cat and are possibly the closest to a natural breed of all the purebred cats in the world. The exact origin of this breed is unknown. Some believe they came from Ethiopia (formerly called Abyssinia). 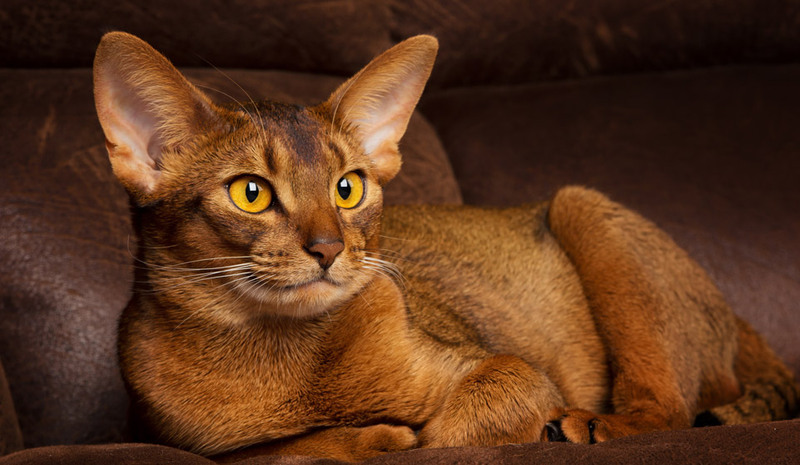 However, Abyssinians resemble the paintings and sculptures of ancient Egyptian cats and there is also some evidence to suggest origins in India. The breed became official in the UK in 1896. This medium sized muscular cat has is reknowned for its distinctive ticked coat i.e. each strand of hair is bicoloured and its large ears. Their head, tail and paws may show tabby markings, but the body of the Abyssinian cat is a whole colour. Common coat colours include tawny, cinnamon, blue, fawn and silver. Abyssinians make good family pets but tend to prefer the company of adults and older children over very young children. They are not lap cats and enjoy being active outdoors and playing with water. This breed have an average lifespan of 15 – 20 years. Renal Amyloidosis –Inherited, incurable disease caused by abnormal deposits of protein in the kidneys resulting in kidney failure. Progressive Retinal Atrophy (PRA) – A progressive condition that leads to blindness. Lysosomal Storage Disease – A defect in normal cell function that mostly affects the central nervous system but can affect a number of systems. Common symptoms include tremors and inco-ordination that can progress to partial or complete paralysis. Patellar Luxation – Dislocation of one or both kneecaps. Ginigivitis – Painful, inflammed and bleeding of gums. Physchogenic Alopecia – behavioural problem as a result of anxiety or stress resulting in compulsive licking and hair loss as a result. Cancer – there is an increased incidence of certain cancers in this breed including Mediastinal lymphoma, thymic lymphoma and mast cell tumours.